“The sum total of 2 1/2 hours worth of images – one meteor!” lamented photographer Roger Hutchinson (see his image below). Two Perseid meteors over Mt. Cephren, in Banff, Alberta, Canada on August 11, 2014, caught in two separate exposures and composited into one frame. Credit and copyright: Alan Dyer/Amazing Sky Photography. A bright Perseid meteor over the UK on August 13, 2014. Credit and copyright: Richard Fleet. Perseid Meteor and the Veil Nebula as seen from Weatherly, Pennsylvania on August 14, 2014. Credit and copyright: Tom Wildoner. The sum total of 2 1/2 hours worth of images – one meteor. A blue Perseid Meteor on August 14, 2015. Credit and copyright: David Strange. A Perseid meteor on August 11, 2014 seen over the Alqueva Dark Sky Reserve near Alentejo, Portugal. Credit and copyright: Miguel Claro. 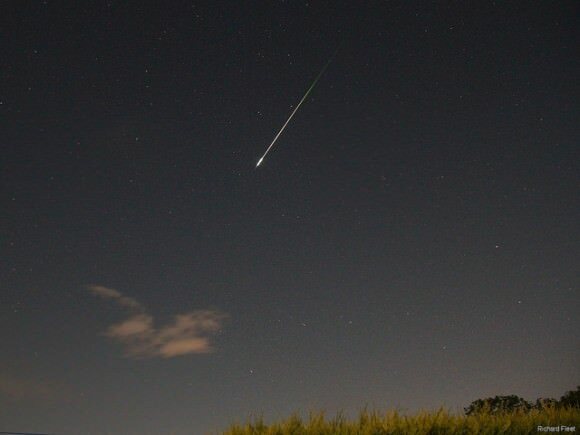 A lone Perseid meteor on August 12, 2014 over the UK. Credit and copyright: Roger Hutchinson. A double cluster and a Perseid meteor on August 13, 2014. This image is a composite of 24 or so 44 second images with the meteor brushed in from the single frame that captured it. Credit and copyright: Brian Who Is Called Brian on Flickr. A bright Perseid meteor as seen from the Exeter Station of the UK Meteor Network. Credit and copyright: John Maclean. Above is one image from John Maclean of the UK’s Meteor Network, who sent us several image. You can see a collection of the best images from the UK’s Meteor Observation Network here. Star trails and the Perseid meteors over the Bembridge LifeBoat Station on the Isle of Wight. Credit and copyright: Jamie Currie. Here’s a compilation of meteors from NASA’s Meteor Network seen from August 12-13, 2014.